Mill Race Park is the wedding photo location owned by the Pearle Events and managed by the city of Cambridge specifically set aside for taking wedding photos on the day of the event. 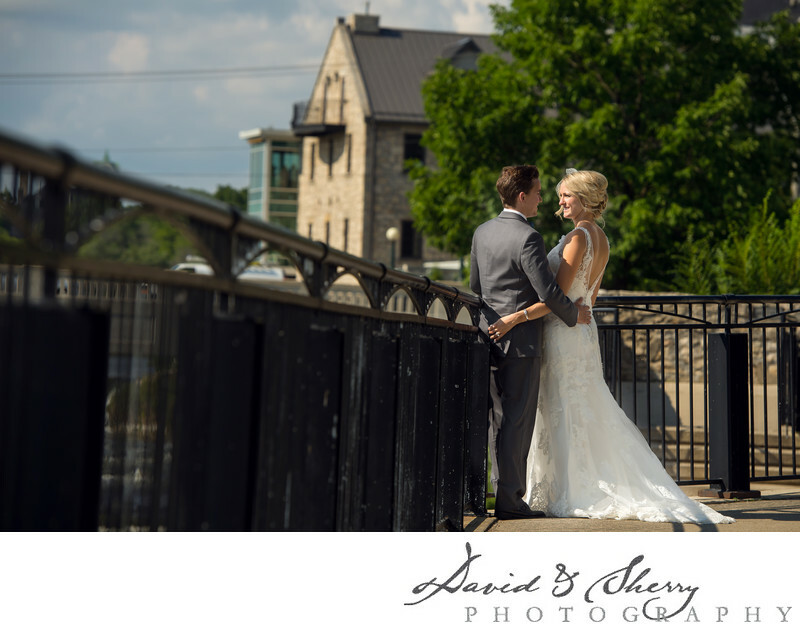 This river side spot boasts some of the most spectacular wedding photo locations due to it's history as part of the mill and the rustic nature of the stone structures scattered throughout it's amphitheatre and pathways. There are little groves of trees that line walkways and bridges as well as wrought iron pathways which can provide beautiful photographic leading lines that will draw your eye right into the beautiful bride and her stunning wedding gown. When we approach photography in a space like this we are first and foremost looking at where the light is coming from. We always ask ourselves the question, How can we best use the available light to accent our couple and make them look their best. They have spent all this time and money on hair, makeup, the dress, the tuxedo, the shoes and the venue, it is now our job to bring it all together and create for them a stunning portfolio of images. Mill Race Park is located in Cambridge, Ontario. Location: 36 Water St N, Cambridge, ON N1R 3B3.